PLAGUED BY A PERSISTENT COUGH? 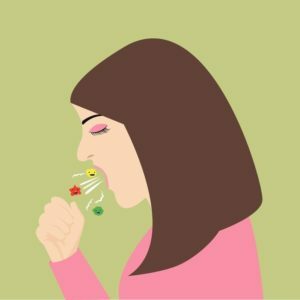 Here are some tips and simple home remedies to support the body in overcoming this affliction regardless of what causes the cough. 1. Cut out all mucous forming foods, especially dairy and wheat as well as all foods you know you are sensitive to. 2. Change your diet to at least 70% raw and drink lots of carrot juice and green smoothies. 3. Drink lots of good water – city water is typically full of chemicals and not recommended for consumption on a regular basis. 4. Keep the chest warm with appropriate clothing. Cut up an onion, place in glass jar and cover with honey (honey can be hard; the juice of the onion will liquefy the honey). Let sit for several hours to several days and strain. Take 1 tsp. as needed. 7. Herbs to use are the ones with anti-microbial properties such as Garlic and Thyme and expectorants for example Mullein (Verbascum thapsus), Licorice (Glycyrrhiza glabra) and Fenugreek seed (Trigonella foenum-graecum). You can find good combination teas for the support of the respiratory system at the health food stores.